1.) 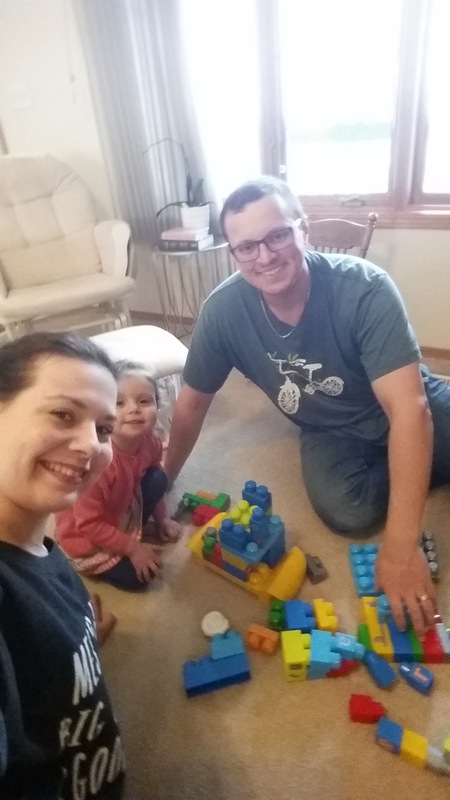 Playing blocks (and all other games) with Miss. E. Miss. E loves building towers and she loves it even more if Hubby and I are in on the action. We have such fun when we are all on the floor stacking blocks. 2.) Most of our things are all packed and ready to go. This move is definitely less stressful than last time! Hubby's brothers are coming down next weekend to help with the heavy lifting. We are so lucky to have family that are willing to help out! 3.) I had to calibrate an instrument at work. We normally calibrate every 6 months to a year, but I personally haven't had to perform the calibration on this instrument since 2014! I was a little bit of a stress case but I got it all done and the calibration worked! 4.) We have had some cold weather these past couple weeks. It is supposed to warm up today and next week. Miss. E and I went out to play the other day after work. I thought she would be ready to go inside after 15 minutes because of the cold. Nope! She was happy as a polar bear. We were out for quite a while until I had to convince her that Mommy and Penny (the dog) were cold. 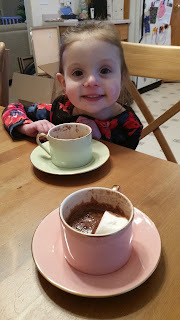 I bribed her with promises of hot chocolate. She thoroughly enjoyed it! 5.) I am reading a great book right now. It is called Present over Perfect and it is written by Shauna Niequist. I am really enjoying the message about intentional living in our lives. I haven't finished it yet, but so far I am enjoying it! I am so looking forward to this weekend. I plan to do a little work in terms of our big move, but I am also planning some relaxation time! I am so behind on reading everyone's blogs and I plan to catch up this weekend! Have a fabulous weekend, friends! Want to join the link up or discover some other awesome blogs? Check out the link-up below! Ha ha! That is so true! Kids love being outside despite the weather.